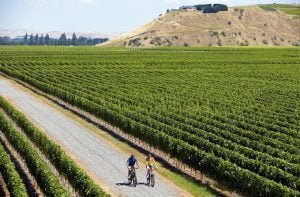 A 100km/60miles-long coastline stretching on the south-eastern part of the North Island, Hawke’s Bay is a major horticultural and viticultural centre. About 5½ hours’ drive from Auckland or 4½ hours from Wellington, Hawke’s Bay has long been called the “Fruit Bowl” of New Zealand, for its horticulture production. 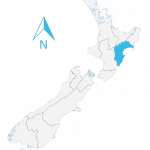 The biggest wine producer of the North Island with over 75 wineries, the region boasts a dry and hot summer/autumn that is particularly conducive to good grape ripening. Temperatures are similar to Gisborne, with a daily average of 22-25C in summer and 10-14C in winter. Hawke’s Bay was named by Captain James Cook in honour of Admiral Edward Hawke who defeated the French at the Battle of Quiberon Bay in 1759. With main cities Hasting (74,000) and Napier (60,000), Hawke’s Bay has an overall population of just over 150,000. Napier’s iconic buildings date back to the 1930s, when the city was entirely rebuilt in the then popular Art Deco and Spanish Mission architectural styles, following a major earthquake in 1931. Much of the local tourism is based on wine tours, but also on this Art Deco heritage, which is celebrated each year in February at the Art Deco Weekend. Other events include Harvest Hawke’s Bay, which celebrates the regions’ wines annually, or Mission concert, an event held at one of the country’s largest and oldest winery, Mission Estate. A great, almost Mediterranean lifestyle and fantastic outdoor opportunities make this family-friendly region a great choice for those looking for the proximity of nature. This may explain in part why the region’s biggest migrant community (by far) is from the UK and Ireland. Leisure activities include endless cycle trails, numerous golf courses, and the world’s largest onshore gannet colony (at Cape Kidnappers). The region also has a good cultural offer with theatre, opera, sports arenas, museums and art galleries. Hawke’s Bay jobs opportunities lay mainly in the primary sector industries. Sheep and beef farming, as well as horticulture (cherries, apples, pears, etc.) are the traditional trades. Fresh produce is becoming important, with a budding organic-growing community. Winemaking/viticulture is also now a major employer: Hawke’s Bay produces world-renowned white wines and full bodied reds (a rather rare occurence in New Zealand), and Napier’s Institute of Technology has internationally-recognised viticulture qualifications.